Do you get the sneaking suspicion that women are underrepresented at our nation's museums? Well, you are correct! Though criminally few female artists are on display, we take you to art by women who rock, celebrate the accomplishments of modern and historical women, and reveal what's goin' down today. We have gathered up the wildest stories and facts on our "bad girls" tour of the National Gallery of Art. 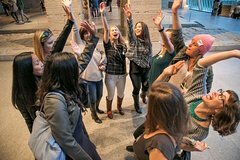 Join us as we celebrate the fascinating tales of all kinds of women at the NGA – presented with all of the subversive and renegade spirit of Museum Hack. • Leave inspired to change the worldPlease note: Admission to the National Gallery of Art and to all its exhibitions, tours and other public programs is free of charge. Any charge or request for contributions is unrelated to the National Gallery of Art. Tour provider is not affiliated with or endorsed by the National Gallery of Art.